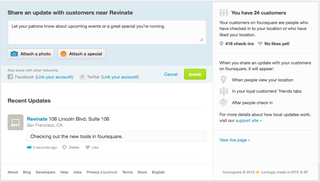 This week has been big for foursquare, the location-based-service integrated into Revinate. In an effort to help people stay connected with the places they love, foursquare launched ‘Local Updates‘ yesterday, which is a free way for businesses to share the latest news about their venues with their customers. Now, venues can share specials, photos and insider tips in a brand new way. New management tools let you quickly update your status and your updates will appear when someone checks into your business or views your location. In addition, the update will appear in your customers’ friend tab because foursquare has changed the way ‘friends’ works so now anyone that has checked in or liked your business is a friend. If you haven’t logged into foursquare in a while to update your account, you should add that to your to-do list. They have made it easy to categorize your business, now differentiating between brands, chains and properties. You can also link your account to Facebook and Twitter so your updates can be shared across multiple networks. Get started today and keep us posted on what you think.